DEVISING indestructible new signage which can survive the rigours of daily life in a safari park was always going to be a tall order. 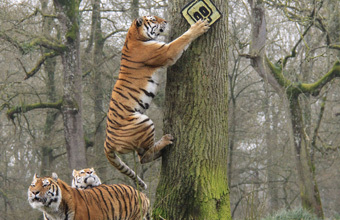 But big cat keepers at Longleat were so confident they were up to the challenge they put the new signs to the ultimate test - with the help of their trio of tigers. The signage is part of a new Deadly Adventure series of features which are being unveiled at the Wiltshire attraction this year and acting as Deadly symbols for visitors to spot as they journey through the park. Deadly Safari is the first experience visitors can get of Longleat's Deadly transformation, with a new guide voiced by CBBC Deadly presenter, Steve Backshall. Encountering some of Longleat's deadliest creatures, visitors learn about the predator versus prey relationships that exist in the wild; discover facts about the animals that reside at Longleat and get to hear stories from Steve's on screen adventures. Longleat's Steve Mytton said: "We needed to create signage which was in keeping with the natural environment, relatively easy for people to spot and also strong enough to stand up to some of the world's most impressive predators - particularly our lions, tigers and cheetahs. "We had a couple of early teething problems but we're now pretty confident we've got the signage in exactly the right areas and although they clearly created some interest among the big cats at first, they seemed to survive their attentions relatively unscathed - and we have got some duplicates ready, just in case!"